properly said advanced Palatine Chapel head. In the 1132 King Ruggero founded the Palatine Chapel and in the day of the Dedication of the Church, the 30 April 1140 open them , sent a Diploma (you see) with which, as Sovereign of Sicily it reserved himself and to its successory straight collativo free full load and of Benefici and Canonicati of the Collegiata Palatine Chapel head of Saint Peter in the Royal Palace and the cure of the spirits it was entrusted to the College of the Canonical Tippets, for which not it is never vacation for the canonical institution. It obtained from Archbishop of Palermo Peter (the 1123-1132) in the same year cure of the spirits for the same one with the consent of its Chapter it (you see Brands), as it ricompensa of the privileges obtained from the King for the Palermitana Church. The Parish had like borders those of the Real, destined Palace to those who they lived to you. 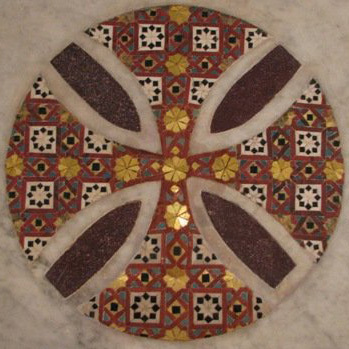 The Dedication of the Church must refer to ancient parochial center, mail in the inferior Church of S. Maria of Hierusalem, since in the 1143 was completed the mosaics of the tiburio of the advanced Palatine Chapel head, than still it was not defined in 1154, year of the dead women of Ruggero. As Rocco Pirro (Cfr. Writes Notitiae Collegiatae Capellae… 1716), they took part to the Consacrazione (of which the red Crosses are still present on the walls) many Greek and Latin presides and Clergymen of the Reign; the name of the consecrating Bishop is not known, but he is much probable one had been Ruggero Fresera or Fesca Archbishop of Palermo (1141 - 1147) to the presence of Gualtiero, Bishop of Agrigento and Stefano, Bishop of Malta. In Privilegy of concession of the dignity of Parish to the Palatine Chapel, is cited the Church of St. Andrew of the Garden, mails of forehead to Saint John (err. of the Hermits) with the Cemetery destined to receive all the inhabitants of the Palace, comprised the Canonical ones. In the 1140 King it equips to the Palatine Chapel of the Cemetary of Saint George the Kemonia. In the 1187 Walter Archbishop declares the collativo right of the King on the Directions of Palatine Chapel and in that of St. Mary Magdalene. For many centuries he is the Singer who the Canonical ones at the moment of the election received the Institution, that is the Mission fronm Archbishop. Erroneously he was believed from Archbishop Papiniano Cusani (1754-1762) that the parochial right was legacy to the figure of the Ciantro (Singer) but a document of 1518 (you see) to company of the Archbishop Francisco Remolino (1511-1518) confirms that the cure of the spirits is inherent to the Chapter it of the Canonical ones and not to the Singer, that has the task, second the Gallicana Liturgy established in the Palatine Chapel, to preside the Chorus, even if in the 1495 it was the custom to make to exercise to the Ciantro the Office of Parish priest, that it delegated to a Sacramentale Chaplain the administration of the Sacraments. From 1518 in then the College of the Canonical ones it wanted to designate to which Sacramentale Chaplain the Canonical D' Anastasio. To the dead women of every Ciantro they happened of the arguments between the Archbishop of Palermo and Canonical of the Palatine Chapel. During the centuries the which released cult divenne: in the r the 1552 Visitor James Arnedo found the Palatine Chapel empty, desolated, abandoned with the Canonical ones that took part in the single day of Saint Peter; in the 1582 Regal Visitor Francisco Of the Sink it found only four Canonical ones to you that four times took part of the year in the festivities of the Chair of Saint Peter, in the Ascension of the Lord (for the Procession), the Ss.Pietro and Paul and S. Peter in ties. In 1634 Cardinal Giannettino Doria (1608-1642) in its Bolla (you see) confirmed Privilegio of the Archbishop Peter who declared the Palatine Chapel nullius Dioecesis, free and free from Diocesan Ordinary, but subordinated to the Greater Chaplain of the King, than you exercised the pontificali functions, presided to the Chapter it, of it removed to a higher court the causes, dirimeva the arguments or reformed the abuses. Like Palatine Chapel of no Diocese the Saint Oils they came captured in the Saint Thursday from the Cathedral Church as they make the Cathedral of Cefalù and Monreale in vacant center. Prebende becames meager and the King Philip VI (in the 1638 and 1641) Carl Emanuele II (1648) and Victorio Amadeus II (1716) increased to them. Till the 1793 they came introduced to the monarch three nominative cases for the election of the Ciantro, the Canonical ones and the Sacramental Chaplain. In the 1794 King Ferdinand IV of Bourbon put end to all the controversies being stopped the office of Greater Chaplain of the King: the episcopal jurisdiction of the Palatine Chapel is classified to the King who confer the offices of Ciantro, of Canonical and the other benefits; the Ciantro presides and directs the Chorus; the Chapter entrusts it who thinks the best one the exercise of the Parochial Cure. The Palatine Chapel was object of privileges from the monarchs normanni, svevi and Aragoneses. It knew a period of forfeiture during the dominion of the Austrians fine that Philip II of Spain supplied to reorganize the clergy, regulamentary some the number, the promotions and the unearned incomes. The same one constituted, in favor of the Palatine Chapel , an unearned income of 3500 shield, successively increased, than originally it came poured ftom General Economato of the Vacant Benefits, more late from Gesuitic Company, therefore from the General Treasury, at last from the Provincial Treasury. According to the Agreed one of 11/02/1929 in Sundays and Festivities of garnishment Celebrating sang a prayer for the prosperity of the King of Italy and of the State (Agreed Art.12); to art 21 comes established that the supply of the ecclesiastical benefits belongs to ecclesiastical authority; the exequatur, the regal one placet, let alone every Caesarean nomination or ecclesiastical direction in matter of supply of benefits or offices in all Italy (Art.24 are abolished). L' custom to introduce a tern of names for the nomination of the Ciantro, only dignity (and for custom Parish priest) is duration until to advent of Italian Republic (18 June 1946) with the nomination of Mons. Philip Pottino in 1950.
" The clergy assigned to the Churches of the Sindone Saint and Superga in Turin, of the Pantheon and the Sudario in Rome, to the annexed Chapels to the Real former Palaces of Rome, Turin, Florence, Naples, Genoa, to the estate of Saint Rossore, to Oratory within the Real former Palace of Venice, to the annexed Chapels to the Palaces of dwelling and holiday of the former monarchs and of the former Real Family and to the Parochial Churches of Saint Gottardo to the Palace in Milan, of Saint Francis of Paola in Naples and of Saint Peter in Palermo, is name liberations, according to the common Canonical Right, from the competent Ecclesiastical Authority ". The Palatine Chapel had the bell tower that was beside the Church, visible from every part, on the model of that one of Saint John of the Hermits; today it is a bell on the door to the Pronao. In the porch of the Chapel four are placed stone to death in order to make memory of the celebration of the Baptism of Ferdinand Francisco (son of Francisco I, in the 1800) and of Ferdinand Francisco (son of Ferdinand III in 1810) and the Wedding of Cristina Maria and Happy Carl of Savoia (1807) and Maria Amalia and Luigi Filippo of Orleans (1809). Every year suffragavano the spirits of the King Ruggero and the two William after the reading of the Martirology (Cfr.A. Narbone Istoria of the Sicialian Literature, 1859). In the pronao the Christening font is placed, but till 1800 it was placed under the ambo, thus like in the Dome of Monreale (Cfr. Nicholas Buscemi News of the Basilica of Saint Peter, 1840). The greater altar has been realized in 1789, with stratums of porfido, mosaics and hard stones; in the same age the two lateral altars were constructed; to right that one dedicated to Saint Peter with the marmorea statue of G.B. Ragusa; on the left that one of the SS. Eucharisty. The left altar has been consecrated in the Eve of Been born them of 1797 from the Ciantro Simone Judica, Burlap Bishop in Africa, like recorded on a lapide; that one of right was consecrated 24 March 1817, like law in other lapide. Vetrate of the windows of the Nail head, imitating the mosaics, were realized for initiative of the King Ferdinand II (Cfr.Buscemi, ibid). Besides these rituali forms ordinary you were some of extraordinary for the Baptisms, the Weddings, the Coronations and the Obsequies of the Monarchs.